An unlikely love story - part sci-fi and part thriller . . . AMERICAN CARNAGE: A LOVE STORY pulls back the curtain on a future where high technology manifests organically within humans and manufactured beings. The play introduces “YML” from an evolved species who is accidentally exposed to echoes of late Second Millennium arts and culture which trigger feelings he didn't expect to have. It's a tale of alternate worlds examining the idea of what is human, where are boundaries when senses have been removed. The surprising sweetness of YML as he navigates from one world to the other is encouraging and touching . . . can experimental beings cross over to a world of feeling in a society where feelings have been lost? 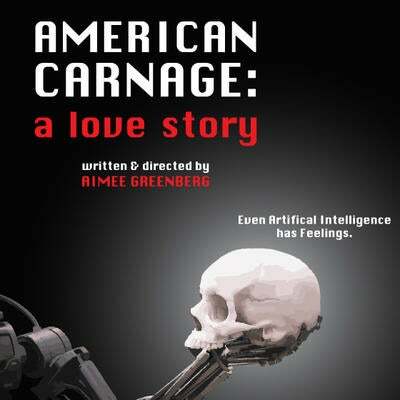 AMERICAN CARNAGE: A LOVE STORY presents a dystopian look at a future shaped by current events.